Powdered Mammoth Tusk is only available in random loot. It cannot be made from mammoth tusks. 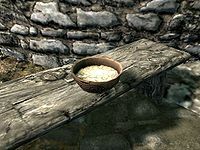 The only way to make this ingredient become available from apothecary merchants is to unlock the Merchant perk (requires level 50 Speech), at which point it becomes considered an "uncommon" ingredient. There are 4 guaranteed samples found in the Forgotten Vale, 3 of them in Falmer camps. Once Fort Dawnguard has been fully renovated, there are two samples located on one of the pairs of shelves between the arcane enchanter and alchemy lab—specifically the top shelf on the one to the left. Three samples can be found in any of the player-built homes if the Alchemy Laboratory addition is built and furnished. One sample can be found within the Tel Mithryn tower on a shelf. Another sample can be found in Tel Mithryn Steward's House on a shelf. The quest Repairing the Phial asks you to find some mammoth tusk powder, which is a miscellaneous item located at Stonehill Bluff rather than an alchemy ingredient. Quintus Navale explains why there is no way to create powdered mammoth tusk—apparently mammoth tusks are extremely hard, and only the giants know how to grind them into powder.